The day before I got back on an airplane, I jumped on the computer and discovered that the Bread Baking Babes, an intrepid group of bread aficionados, had been at it again. 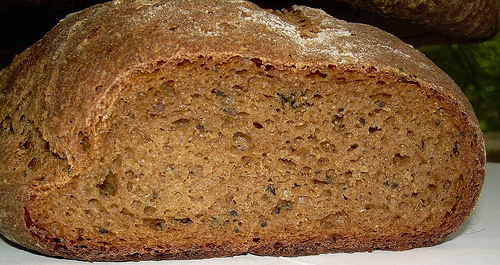 This time, the bread of the month was an incredibly fascinating recipe for Russian Black Bread. Why “fascinating?” Because the recipe called for sourdough starter, plus yeast, plus coffee grounds, plus crusty old stale bread pieces. In fact, one of the unfortunate nicknames for this baked good is . . . “dump bread.” How could I pass up an opportunity to make such a bread, especially when this month’s Bread Baking Day theme is to bake a bread you’ve never made before? So, I got to work. Luckily, I had been feeding my sourdough starter, Son of Boris, so he was ready for action. Boris Senior died earlier this year, when I discovered that he was consorting with something pink in his sourdough container. So down the drain he went. Both of them were derived from a sourdough starter recipe by their godmother, Mary over at The Sour Dough. So, this recipe starts with a sourdough mixture, and a soaker which is supposed to sit for 12-14 hours. My sourdough sat for 19 hours, and when I took a look at it it was bubbling away, a welcome site to anyone who bakes with sourdough. The soaker was very interesting, indeed. You see, in addition to fennel and caraway seeds (which I have on hand and actually was able to find! 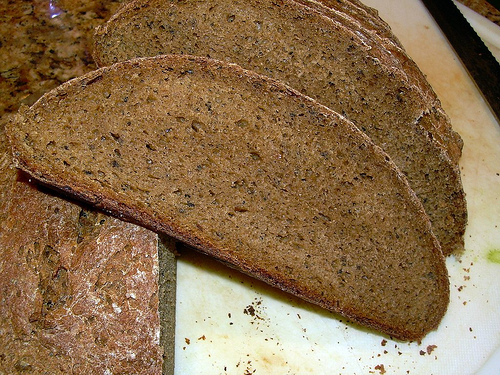 ), I had to toast up some stale bread from my freezer, and grind up some coffee. As luck would have it, all I could find was Mystic Monks Rum Pecan coffee. Now, I am NOT a fan of flavored coffees, with a couple of exceptions, and this is one of them. So, I thought, what the heck! And in went the Rum Pecan coffee grounds. Yes, never let it be said that we home bread bakers don’t like to live on the EDGE! 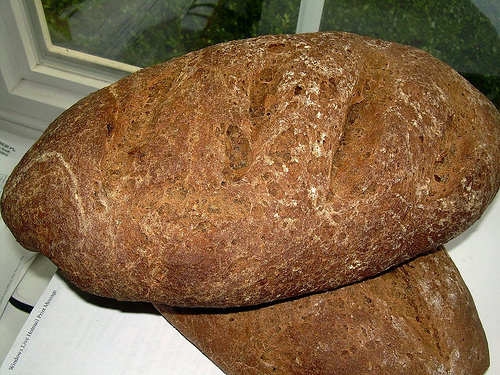 Flours used: King Arthur Medium Rye, Arrowhead Mills Rye, and Golden Temple Whole Wheat Durum Attah Flour. To make up for not be able to find the high gluten flour (I know it’s in my freezer, aka “the Time Machine,” somewhere), I added 2.5 Tablespoons of vital wheat gluten (Hodgson’s Mill), following Karen’s lead over at Bake My Day. The dough came together very easily, and I kneaded it in a stand mixer for about 12-15 minutes at low speed. It was pretty sticky when I took it out to rise, but I did not add more flour because I’ve found that the stickiness tends to diminish after the first rise with most breads, and I was right. I decided to shape the loaves into batards, mostly because I stink at it and need the practice. After slashing the tops, I popped them onto the baking stone. To my surprise, the loaves baked up beautifully, and did not explode or develop odd growths due to my having shaped them incorrectly. The loaf was chewy but not too dense. And the flavor was amazing – deep, complex, with hints of sweetness (from the molasses), sourness, and . . . coffee. Yes, the coffee flavor, not the rum pecan flavor, came through in different bites. In fact, this is the most complex rye bread I’ve ever made in terms of flavor, so if you love rye bread, as I do, you will probably enjoy this one! Thanks to the Babes for inviting all of us to join them. Gorel at Grain Doe will have a list of everyone who participated, as well as the recipe. 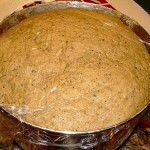 And please check out imafoodblog for Sara’s Bread Baking Day roundup after September 1. And every week, Susan has a YeastSpotting roundup, which is always fun and inspirational. 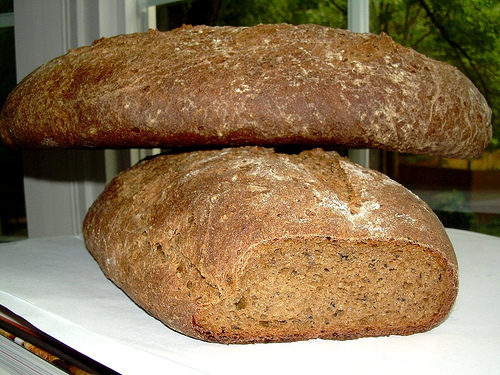 I definitely got the molasses and the coffee flavors – what a wonderful bread! I didn’t slash mine, so I got growths, but yours is just gorgeous. That was a great idea, using flavoured coffee! I would never have thought of that. Beautiful loaves! Thanks for baking with us! That is a pretty amazing bread. I saw it on someone else’s blog and it didn’t bake up quite as nicely as yours did. It didn’t hold as nice of a shape. Yours look really good!! This is my upcoming weekend project. I will try to wake up my rye starter that has been hibernating in the fridge for too long. I hope my bread turns out as well as yours! Yes, complex! The fun part is that it keeps so very well so you can enjoy every single slice. Great job! I would say you’re definitely on the edge with that rum pecan coffee 🙂 but wow your loaf looks nice! Gorgeous loaf! The extra gluten clearly is a good idea. Interesting that the flavor of the flavored coffee didn’t come through but that the coffee flavor did. I liked this bread a lot, and even more the next day. Great job on yours!! What a fabulous post, this bread is intriguing to me. We rarely bake breads with so many different types of flour, I would love to try this out. Thanks for joining us for this month’s BBD!